2.) Tell us about the rest of the series. Over the course of the trilogy, you join our protagonists as they uncover the sordid truth and dark history of their society, Paragon, a place set in a world much like our own but with some important (and chilling) differences. In fact, some members of this society are so blinded to the truth that they don’t even realize they are, in fact, living in Paragon… which is something you get to experience firsthand in Book 1. (Trying not to give away too many spoilers here!) In Book 2, we learn more about how this world came about, and in Book 3, the main characters struggle against nearly insurmountable odds to try to bring those responsible to justice. And of course, there’s some romance along the way! “But how can we continue to keep this from everyone?” Janie interjected. “It’s not right. They deserve to know!” she hissed. Yes, she thought, just like Isaac deserves to know that his brother might still be alive – but she couldn’t bring herself to say anything about that, either, knowing the guilt would eat him alive. She at least had to be sure first. She had to know it was really Joe.
" I really liked the first two books in this series, and I waited 5 years between book 2 and this one. There was one point I know that I even reached out to the author to find out if this one was coming soon, because I needed to know what would happen next. . . . There was just so much going on in this book! . . . if you haven't started the series yet, you are the lucky one to get to start with all three of them out now. You can sit down and read them all, back to back, and get all the feelings that will come with a good series." 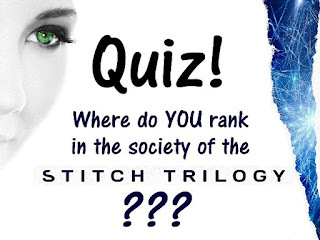 "I've waited a long time to read this last book in the Stitch Trilogy. I loved this series from the first book. It was so unique and had so many twists and turns that kept you reading. Guess what? Things haven't changed in this third book: It's still has so many unique things in the story line and the the twists just keep on coming. . . . 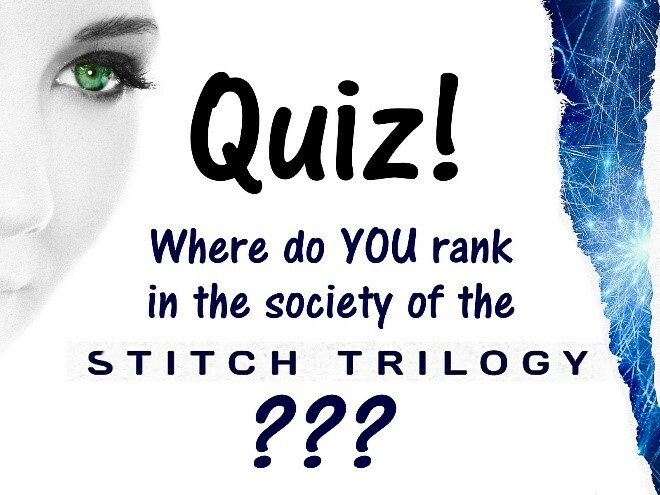 If you like the Dystopian and Sci-Fi genres, you need to put the Stitch Trilogy on your To-Read list immediately." "There’s plenty of action, intrigue and betrayal. But there’s also bravery, romance and hope. . . . A perfect finale to a series that fueled my imagination and captured my heart." 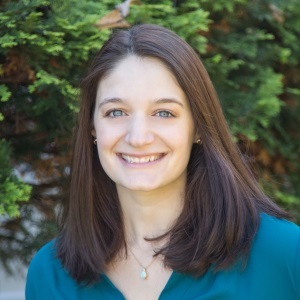 "This premise for a science fiction novel is so unique, and that truly drew me in. . . . I would recommend this book to anyone looking for a new upper YA or NA science fiction trilogy with a strong female main character." Deion chuckled and shook his head at the sight of his best friend – shirtless, sweat gleaming off his abs – precisely positioned so that anyone passing by the construction site would get an eyeful of his chiseled physique. “58,” Alex argued, heaving another stone on top of the wall he was building for this set of Paragon’s latest drama. “That’s almost in the sixties.” He paused to swipe a dusty, rippling forearm across his brow, brushing the fringe of straight black hair from his striking, angular eyes, which were narrowed against the sun. "It's been a privilege to follow along with Samantha Durante since this trilogy first started! 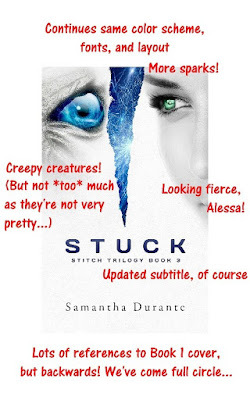 I felt a little woeful as I started to read Stuck, only because I knew that this was the end of my time with these characters. After completely falling in love with the last book, I knew that this finale was going to be a rough read for me either way. It's the end of an era, really. It's been fun! . . . If you haven't started this trilogy yet, you're in for such a treat. I envy you. I really do. Is there anything you would like people to take away from your book? 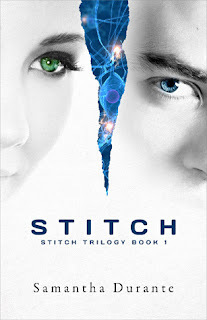 There are SO MANY things I’d like people to take away from the Stitch Trilogy! First, that things aren’t black and white. Just like real life, no one in my books is infallible, and anyone can make a mistake that can really hurt other people – and this can happen on a small or very large scale, even with the noblest of intentions. Second, that anyone can make a difference. It would be easy for anyone living in that world (or any world!) to feel insignificant and powerless, but the characters work really hard and work together to make things better, and they manage to do so even against odds that seem insurmountable. Third, that inclusivity and diversity of thought are good things, especially when it comes to leadership – otherwise you’re almost certain to further exploit already marginalized groups, and foster a lot of ill-will. And finally, that love conquers all. At the end of the day, even (perhaps, especially) when the world has gone to hell, all we have is each other. Be selfless. Be brave. Be kind. 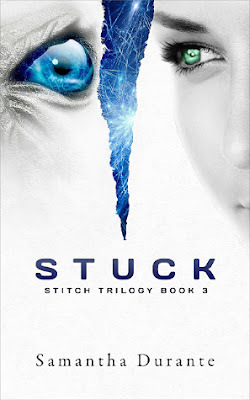 "Stuck is a phenomenal completion to a wonderfully complex, challenging, and heartfelt adventure. My heart jumped for joy when I found myself finally reading the last chapters of this brilliantly original and deeply captivating journey full of heart, hope, and love. . . . 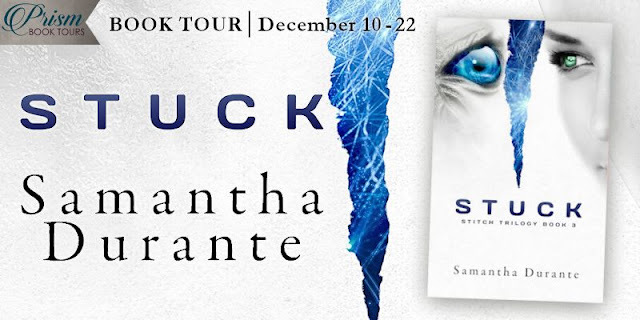 I have been looking forward to this elusive ending, and I found myself completely and totally satisfied in every way a story can offer. . . . Samantha Durante has once again left me in awe of the depth of her brilliant creativity and boundless heart." 1. What made you decide to be a writer? I don’t know if it was a *decision* so much as a compulsion! I’ve always loved to write, ever since I was a kid. I got away from it for a few years in college and afterwards, but even as a software engineer, I managed to“sneak” writing into my job. So when it came time for a major life change (moving back across the country to be near my family), I knew it was a good time to see if I could shift gears and get back to doing what I’d always loved. 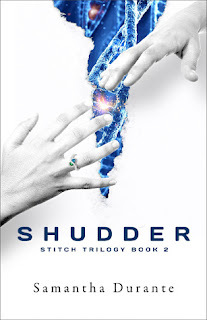 "If you love having your emotions ramped up to a fever pitch, if you love white knuckled reading, if you love apocalyptic/dystopian novels and are looking for an original storyline, you may want to grab the Stitch trilogy." 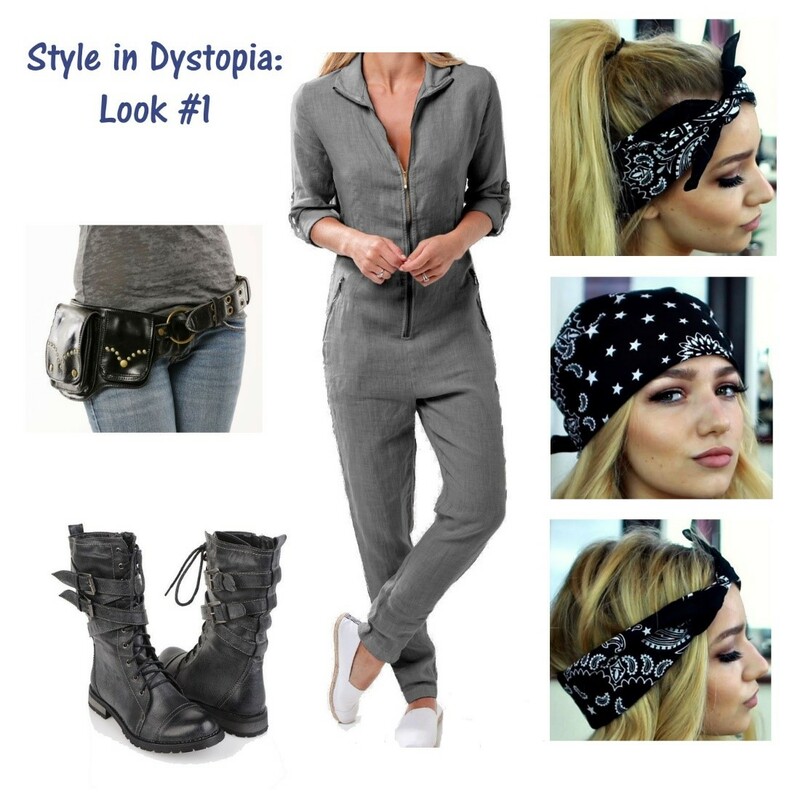 Dystopian societies aren’t often known for their embrace of individuality and free-thinking… which unfortunately means their fashion trends tend to lean towards the sterile and conformist, at best. I enjoyed the excerpt and reviews! Looking forward to this!